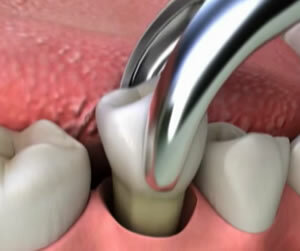 A tooth extraction refers to the procedure of removing a tooth from its socket. First, a local anesthetic is applied to make the procedure more comfortable. In some cases your dentist will elect to use nitrous oxide gas in addition to the anesthetic. A dental instrument called an elevator is used to wiggle the tooth in its socket. After the tooth is loosened it is removed using forceps.